I love planting herbs in my flower beds. They are fragrant AND functional AND beautiful (see there, three things herbs do). Many in my zone (zone 5) such as sage, chives, greek oregano, mint and thyme are also perennial, which means they will give you years of joy and use. Herbs such as basil, rosemary, parsley don’t quite make it over the winter here in Illinois, but they thrive in the summer outside. And if I am responsible enough, I remember to bring them inside in the winter. In the summer, I prefer to use fresh herbs, because, well, I can and all I have to do is walk outside and snip some fragrant sprigs. However, early summer is also the time to start drying for year-round use as this is when many herb leaves are most pungent. Last year, I dried Rosemary, Sage, Greek Oregano, Thyme and Cilantro. I dried a lot of plant material. So much, that I gave a chunk of it away for Christmas. I thought I kept enough for myself. Sadly, I ran out of oregano in March. I was kicking myself when I broke down and bought it at the store (twice) because I could have harvested it for free from my garden. So this year, I am going to dry a lot more. Starting today. Below is my tutorial for drying garden herbs. To be honest, I haven’t dried basil because I prefer it fresh. Also, I can’t get chives to turn out right (though that’s okay because these suckers grow until the snow covers them). But this method has worked for rosemary, thyme, oregano, sage, tarragon, dill, fennel leaf, and mint. 1) Gather bunches of your herbs. It’s okay if you cut the plant back significantly, up to 75%. It’ll grow back. If the herbs are dirty, wash your bunches and shake off excess water. If the herbs are clean, adding water only encourages mold. Don’t worry about the bugs… you already consume them in all the other food you eat, as allowed by the FDA. (Here’s a fun link to make you never want to eat again!) On the bright side, whatever you pull out from your garden is likely cleaner and less buggy than store bought stuff. 2) If you did not wash your herbs, skip to step three. Otherwise, lay your herbs on a clean dish towel in more or less a single layer to dry off excess water. If you have a lot of herbs, you may need more than one towel. The idea here is to just dry them off as much as possible. 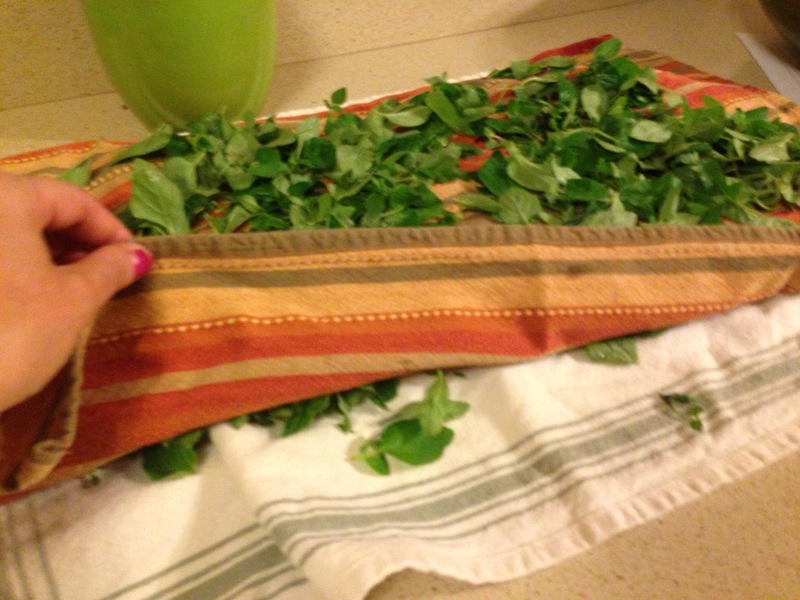 You can use paper towels for this, but you’ll go through a lot of them to get your herbs dry. 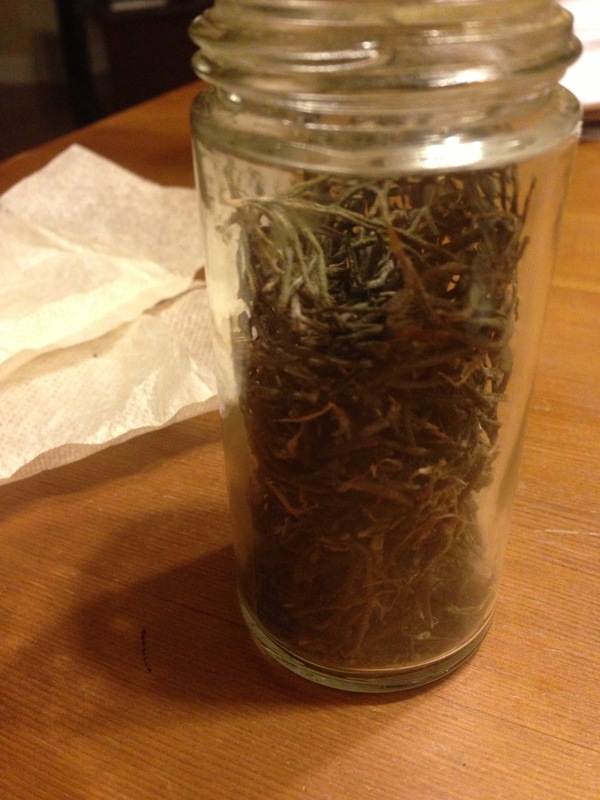 3) When your herbs are free of water, strip the leaves from the stem. Many people hang their herbs by the stem. That method works fine…except that your herbs accumulate dust (and in my house, cat dander) in the several days it takes to dry them. Plus, you’re supposed to keep them out of the sun, in an airy location, in small bunches, etc. If you’re drying a large quantity, this is not practical. Really, they’ll just be a challenge my cat has to meet if I start hanging things all willy nilly. And I have found that herbs left on the stem take longer to actually dry (you know, because the stem is a food supply). For those reasons, I immediately strip the leaves from clean and dry herbs. You don’t have to be that precise about removing every stem at this point because you will continue to clean up the leaves at every stage. Lay your leaves in a single layer on the clean and dry towels and cover with a clean dry dish towel. 4) Up to now, you really have been working on getting your herbs clean and dry. You have stripped the stems to get them ready to dry. Depending on the quantity of herbs I am drying I use 2 different methods. For small quantities, I stick them directly into these tea pouches that I always have on hand for loose leaf tea. The herbs stay in there, protected from dust until they are nice and crinkly. I then transfer the herbs to a glass container and keep in my spice drawer away from the stove. 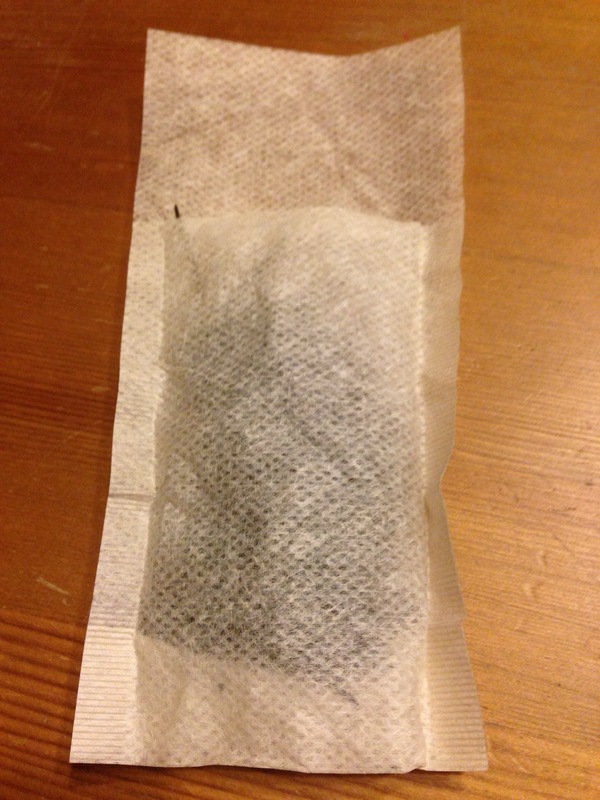 These tea bags are perfect for low-fuss, small quantity drying. If I wanted to have 30 of these little pouches all over the place, I could dry larger quantities, but for me, that’s not practical. However, for large quantities, you need to lay the herbs in a single layer across a larger surface. My preferred method is using paper towels. I know! This is wasteful BUT paper towels work beautifully for herb drying because they are very light, wick moisture and allow air to pass through multiple layers). You can re-use them when you are done drying the herbs, so it is not all bad. You can also use coffee filters and cheesecloth. Or, if you are super ambitious, can make a framed screen to use over and over. 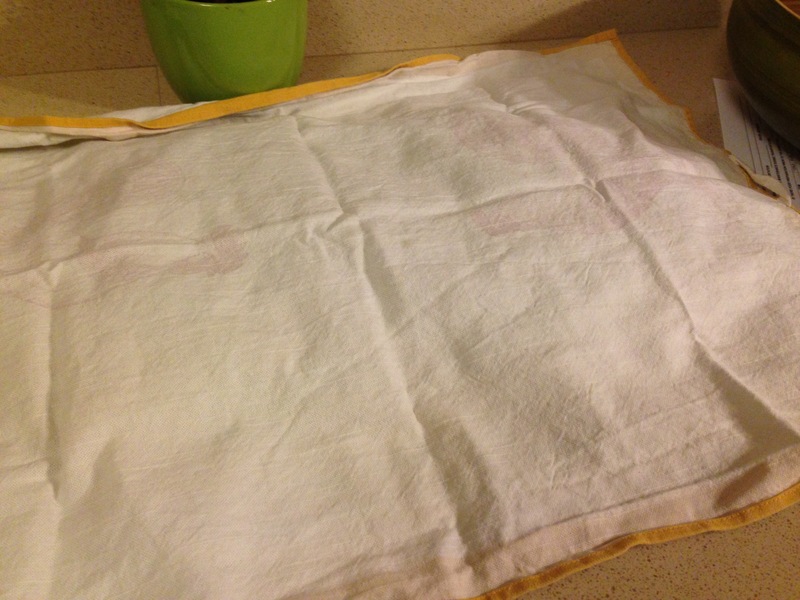 Dish towels don’t work well for multiple days of drying because they are heavy and tend to enclose the layer of herbs and retain moisture underneath. Depending on the herbs, they will take anywhere from a couple days to several days to dry. When they crumble between your fingers, then are done. Keep them as whole as possible to retain as much flavor as possible. I don’t really think it matters if you store them in a cool, cabinet or the refrigerator as long as they are in a sealed container. I moved into my home about seven years ago. Like many planned neighborhoods in middle class communities, professional landscaping didn’t come with my house–or rather, the previous owners didn’t spring for the $10,000 upgrade. Instead, I had a mismatched, poorly placed amalgam of shrubs and weekend project landscaping. That meant most of of the shrubs were planted way too close to the house, were half dead and just plain ugly and all of the hardscaping was wonky and random. Most of the bushes were spirea and yew, two of my least favorite plants. So that very first summer I tore out a lot of bushes. The previous owners also had built up this weird pile of dirt in the backyard that they surrounded with rocks. It had some firebushes in it, but mostly just weeds. It looked bad, but I wanted to use what they had already started, so I had a professional come in and build a retaining wall. The same professional also built a low wall around the garden area the previous owner had started in front of the bay window. By the way, unless you are actually a landscaping professional, I highly recommend that you spend your money in the hardscaping by hiring a professional. Otherwise, your project will look wonky and random in a couple of years. This hardscaping left me with a couple of big empty spots to fill and not a lot of money to do it with, since I just had a professional come in and build the walls. So knowing a little bit about plants, I raided my mom’s beautiful garden filled with hostas and lilies and several different kinds of sedum. I didn’t do pretty job of taking her plants, either. I dug some up, tore some apart and then just stuck them in plastic bags with some dirt and carried them home. I probably didn’t even plant them for several days. Then, when my sister moved out of state three years ago, I dug up some of the purple columbines she had growing all over her yard. Then there was the clump of chives my friend’s mom gave me a few years ago and the clump of mint my mother-in-law gave me last summer. Hint: Alway pot your mint. It will take over your yard. I’ve got some hollyhock seeds a friend gave me a couple of years ago. And so on and so on. Slowly, my gardens started to fill in. Now, I am not saying I don’t go buy an occasional Perennial. I sometimes can’t resist. It’s not always possible to get the right height or color if you do it the mostly free way. But it would be unusual if I spent more than $10 a year on my flower garden. I always buy low maintenance flowers that I can get a lot of use from and that I can usually divide right away when I plant them. Or I try to buy when flowers are on sale. For example, it’s only the second week of may and stores already have their potted spring bulbs on sale. I could have gotten roughly ten hyacinth or tulip bulbs for $1.50 at Walmart the other day…come to think of it, I don’t know why I didn’t. They wouldn’t have come up again this year, but then next year, when I forgot all about them, they would have been a delightful surprise. 1) You can take cuttings of many plants such as thyme, lavender, rosemary, sedum, mint, and sages. Or even bushes like willows, forsythia, lilacs and dogwoods. A cutting is literally cutting off several inches of the plant. Most of these plants will root readily without hormones and can be placed directly in water to root. Many can also be thrown directly into dirt and will survive (sedums, for example, grow like mad!) This is one of nature’s methods of survival, so for the most part, you can take cuttings at any time, though you may have more success at certain times of the year over others. And rooting hormone doesn’t hurt. In fact, it might help. It just means you will spend more money. You’d be surprised how many plants you can grow from cuttings. If you ever really like a plant or a shrub in someone’s garden, ask if you can snip off a small section and then stick it in some water to see what happens. 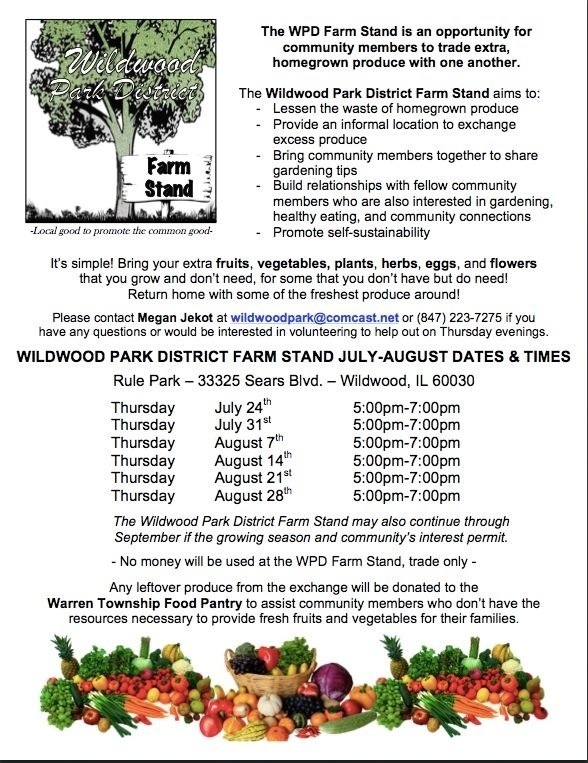 You may have just gotten a cool free plant. The little sedum below was started just last year from about two inches of cut plant materials. It will have nice yellow flower in the summer. 2) In many plants with bulbs and fleshy roots, you can often take one plant and divide it so that next year you have several. If you ever dig up a clump of bulbs, you will notice small pieces ready to break off from the larger bulbs, or tiny bulbs that have developed since last season. Asian lilies and grape hyacinth are easy to propagate in this way. Below is just one section of grape hyacinth that I have in my gardens. I think I originally purchased a dozen bulbs about five years ago. I have hundreds of these now. They are an early spring flower and last much longer than daffodils. Below these lilies self-propagated from last year. If you can see the small clumps that have begun at the bottom, I could take those and start a whole new section of lilies. I will probably do that this weekend. I’ll include Bearded Irises in this section because even though it is a rhizome and not a bulb, it kind of looks like and acts like a bulb. Each leaf spike tends to come from a bulbous roots. These are currently the bane of my existence. I have dozens and dozens of these. They spread very fast and I am out of space for them. I either have to start a new garden or start giving them away…or maybe both. 3) With plants like lily of the valley or hostas, you just have to dig up one or two plants with roots intact and before you know it you will have many plants. This group of lily of the valley below started as maybe one or two little plants. I now have a few dozen. With hostas and lily of the valley, it’s easy to separate, because the plant separates itself for you. You can see how even though the hosta above looks like one big plant, it is actually many plants with roots that are interconnected. The hosta I just transplanted in the last photo show this most clearly. I was able to dig up the plant in parts and put it all back together. I could also have divided the plant into two or three plants. In plants that tend to look more like a solid structure, taking a shovel to them can be scary. But, for the most part, you won’t hurt them. You can divide a lot of plants, such daisies, siberian irises, day lilies, sedum… you literally just take the plant and tear it apart. The sedum above is in desperate need of some dirt. However, the picture shows the top of the root structure and demonstrates how if you took this one plant and divided into the three sections it is naturally giving us, you would have three plants. Also the daisy in the next picture is one big plant, but I could take a shovel to the middle of it and divide it into two individual plants. Technical, horticulture-y websites say use a sharp knife and to do this at specific times of the year, but, honestly, you don’t have to be that gentle or precise. Plants have many defense mechanisms to make sure that they continue to grow. It is far more important that you treat them well after you plant them then how you go about getting them to the point you can plant them. You can’t let the plants dry out and die after you stick them in the ground. In the siberian iris below, I was tearing some clumps apart to replant and this one came away without any roots. However, I decided to stick it in the dirt in any case and see if roots would form. I kind of think they might. Along these lines, many bushes and trees tend to send up suckers from the roots. You can remove these and start separate plants. Clearly these will take a lot more patience before you get them big enough to use, but it may be worthwhile, especially if you garden is still a work in progress. 4) Many perennials self propagate through seeds. You can try and control this by dead heading and removing the seedheads. If they drop in the garden, they will spread quickly. This little coneflower below has started in the crevasse between my walk-way and the retaining wall. Seeds tend to gather there and every year I have baby plants that sprout up. If you want to collect seeds (which, of course, you do), make sure the flower head has bloomed and is fully dried. In plants such as columbines, day lilies, and siberian irises, the seeds will literally just fall out of little cup like pods. With flower with spikes, you can usually wait until the flower is done and browned and then shake the sees off the spike. With larger flower with centers, the seeds are usually left in the middle and sometimes all that is left on that flower stalk after the flower has died. You can collect them to share or you can collect them to prevent crazy propagation or plan where to plant them. Otherwise, you can’t control where seeds land. The next thing youknow you havepurple coneflower and salvia popping up all over the place. I like to dig these up and keep them in a separate pot until I either know what I would like to do with them, or I know where I can give them away. So find a friend that really enjoys plants or has spent a lot of money on professional landscaping so you can scavenge plants. If you are friends with me, I love sharing my plants! Come armed with some dirt and trowels and let’s get to work. If you are not friends with me, you really should be. I am very nice. But, you can also talk with a neighbor and exchange two or your purple tulips for two of her yellow ones. Or tell your friends and family that if they ever feel like buying you flowers, to buy you someone potted so you can replants it (so…not a tropical houseplants, please). There is a TON of information on the web about plant propagation, but I would encourage you to just try it. If you like a plant, take a few inches of it and come how and stick it in a vase in the sun. Once it develops a few roots, try putting it in some dirt and watering regularly. I love this time of year in my garden because it changes every year and I get a first peek at what this year is going to look like. Below is a small columbine and sedum that popped up. I get to see what has spread and decide if things need to be moved. Okay, well, that part I don’t exactly love. Gardening can be a lot of work. But I put in the work into my garden because in, like, 20 years, I will havethe perfect garden! A garden is a constant work in progress and is constantly changing. I live in zone 5, so not all the plants above would work for your zone, but all zones have plants you can propagate. In fact, your perennials are probably our annuals (which you can also propagate in zone 5, I just don’t bother with annuals). I would welcome your input and comments. And seeds. This year I am actually growing some seedlings inside to transplant outside. I bought these Burpee compostable packs for the job. They are cheap, about 15 cents each, and go directly in the ground when you are ready to plant. But as I was looking at them, it occurred to me that they are really just pressed paper. If you’ve ever made home made paper on a screen, you’ll understand what I am talking about. If not, let me explain. You can make that thick, fancy textured paper by shredding paper, blending it to pulp, and pouring out onto a screen and pressing out liquid, then letting it dry completely. The paper will end up having the imprint from the screen. I thought surely I could figure out a way to make these. I didn’t know if I would use the screen…that imprint was just the clue that keyed me on to the idea of making these. The trick would be to be able to mold them. As I normally do with projects I have an inkling for but no clear direction with, I hit the internet. Surprisingly, I really couldn’t find a precise replica of these. At best, I found methods using newspaper “cups” (really, just taking newspaper and making a flat bottomed cup), toilet paper rolls (almost tempted to use this), paper egg cartons (clever but too small, I thought) and eggshells (cute but impractical) . I was fully expecting a paper mache option to mold your own cups or pots, at the very least. Being unsatisfied and having a rudimentary understanding about how to make paper, I stumbled through this on my own. I took a couple of cardboard boxes out of the recycling and started tearing them up. I then soaked the cardboard. While soaking the cardboard, I again researched how to add more structure to the cups. I was afraid that the moment I added water, they would fall apart. I saw some suggestions online about added dryer lint to as a way to make paper. I figured that since it was not paper, it might add firmness to my cups. I went to my dryer and grabbed a thick wad of lint and threw it in my soaking paper. Too late I realized what a bad idea that was…especially if I were actually making paper to give away. My dryer lint is full of cat hair since I have two of the furry little beasts. However, since these were ideally just going in the ground, I was still hopeful the lint–hair and all–would add structure. I added more water and then threw in about a quarter cup of flour on a completely untested theory that it would make the paper harden more (a la paper mâché). I then threw it all in the blender. Careful if you add lint, the stuff tends to wind around the blades kind of like the underside of a vacuum. When done blending, I then had a bowl of really awful looking stuff. It felt really gross. Kids would probably love this project. As I mentioned above, the biggest challenge I faced was how to make pot shapes that I considered big enough plant in. The best solution I could come up with was using these silicone cupcake molds. They were a lot smaller than I would have wanted, but I figured that seedlings don’t get too big before you stick them in the ground. (Based on this thinking, I don’s know why i insisted the egg carton was too small… maybe I just wanted to make pressed paper pots.) I figured that the silicone would peel easily from the dried paper and I wasn’t bringing other waste into the mix. If I hadn’t gone with those, I would have tried to use plastic cups… as long as I was recycling them (saving them from the trash to reuse and/or continued to use them afterwards.) If you go out and buy the plastic cups for the sole purpose of making these and then toss them out afterwards, you’re defeating the purpose of making recycled projects and should just use the plastic cups as planters directly. The first couple cups I tried to make free form by pressing small sections onto the mold. But then I figured out that I could just use an empty mold to squeegee out the water and help shape the mold I was working on. I made sure to apply to pulp thickly to avoid thin spots and proved enough support. The entire process was a bit labor intensive, but in the end I was hopeful. My husband, on the other hand, was very skeptical. 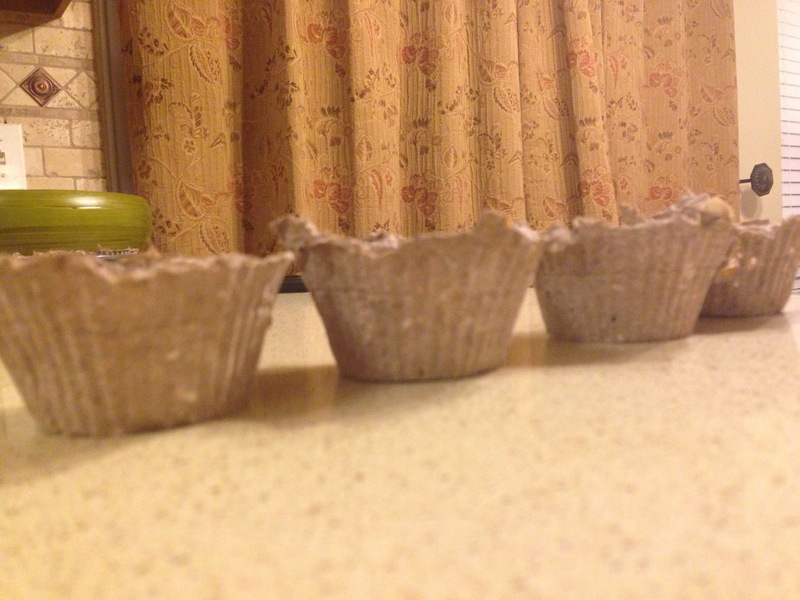 I started to blog right away about these, even as my little cups sat there all soggy and sad looking. I told him that I felt confident that they would dry…but I honestly had no idea what would happen once I added dirt and water. Sure enough, the cups dried beautifully in about three days. I would have liked to have left them outside in the warm sun to dry faster, but it’s April in Illinois, and warm sun is scarce. I might have tried baking them to dry them out more quickly, but I remembered the hairy lint and knew that would be a smelly, bad idea. Alas, I have not really provided a precise recipe or method, either. More like an idea and a plan. I would love feedback if anyone out there plays around with the idea. I don’t know if the flour and lint are necessary, but I feel that they helped make a sturdier end-product. It is important for me to consider how cost effective these projects are. But the costs are not all measured in money. I would attempt this project again because I saved money, and found a good use of waste materials, and produced something using no emissions. I am going to plant them and report back how well they hold up! I hope to soon show you pictures of little seedlings!